Equipment is now complete in the “fridge” (remote enclosure). Finalisation of the software testing for SCADA control will continue over winter for a spring installation of the Remote site. Negotiation of a site agreement and installation of antennas and the enclosure will be a spring activity (dependent on the Mt Climie upgrade). Changes in software configuration at Colonial Knob to provide for point-to-point communications to Mt Field, Mt Climie and Johnsonville link sites. Installation at the Mt Climie site of a number of nodes (local access node, and point-to-point backbone links to Wairarapa, Colonial Knob, Mt Field, and Ngaio. This will include installation of a RemoteDX pole, a pole mounted switch, and trenching for POE feed. Some software upgrades to Mt Field to provided point-to-point backbone link to Colonial Knob and testing site locations for a link to Mt Climie. 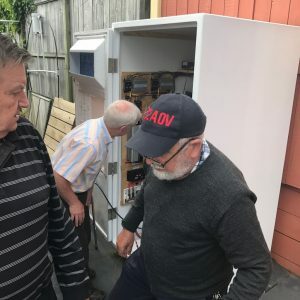 Small teams of RemoteDX members will be needed for the Johnsonville and Ngaio upgrades, and a large team (over 3 visits) will be needed for Climie installation. Branch 69 will manage installation at Mt Field. Many upgrades can occur over winter, but the Mt Climie visit will be scheduled on fine warm weekends in Spring. The RemoteDX Inc inaugural Annual General Meeting was held on Thursday 3 May 2018 from 7.30pm at the Tawa Community Hall. 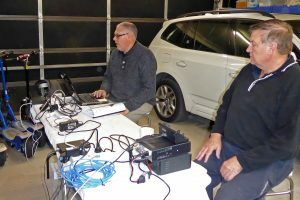 Following the AGM, Mike ZL1AXG and Bernard ZL2BD gave a presentation on progress over the past 16 months and a demonstration of the remote transceiver operation over mesh nodes. Supper was also served. A backbone needs to be developed to reduce mesh traffic, by isolating sub-nets. Mesh users around Wellington have been asked to provide access to nodes to allow the upgrading to take place. Most nodes are now operating on the latest AREDN release. We have found that over the air upgrades are not always reliable, so it is best to do these in situ. Note that if you wish to purchase a Ubiquiti node, most are no longer compatible with AREDN or BBHN (no longer under development). The AREDN team will release a new version of the software in the new year that should be compatible with the newer Ubiquiti products. The backbone links between Mt Field and Mt Climie, Mt Climie and Kaiwharawhara Hill (Ngaio), and Kaiwharawhara and Johnsonville (ZL2TBU) will be moved to 5.8GHz off-mesh links over the summer. 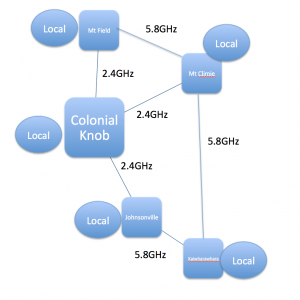 Colonial Knob backbone connections to Mt Climie, Mt Field and Johnsonville (ZL2TBU) will remain on 2.4Ghz due to restrictions on use of 5.8GHz at Colonial Knob. However, it is planned to move these off mesh to reduce traffic loadings and improve throughput. The committee had a working bee on Saturday 30 September and can now report that the temperature control system is complete (just the cowlings need to be painted and mounted and the filtration system installed). In addition, the station is running off batteries with the solar charging system under test. We spent most of the time upgrading Ubiquiti nodes to AREDN v3.16.1. Further work to recover dead mesh nodes and to run out software upgrades on the Wellington mesh network is planned over the next fortnight. There will be a further working bee over Labour Weekend to upgrade the network and begin to install a backbone (non-mesh) between significant nodes, so as to partition the network and reduce unnecessary hops. 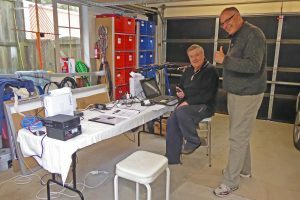 On Queen’s Birthday Monday, a bleak and dreary day in winter, Bernard ZL2BD, Doug ZL2AOV and Mike ZL1AXG met at Bernard’s QTH to test the use of our RemoteRig units over the mesh network. Bernard ZL2BD is seated at the Control Station end with the IC7100 control head. Mike ZL1AXG has thumbs up, because the control head is controlling the radio end via the mesh nodes. The mesh units are located on the elevated white boxes. The Remote Rig devices (Radio and Control units) were configured with the radio end with a fixed IP in the address range of the mesh node. The control device was configured to acquire an IP address using DHCP and connect to the fixed IP address. The two mesh nodes can be seen on top of the white boxes with an air gap in between in the photo to the left. The RemoteDX Inc transceiver, an ICOM IC7100, can be seen on the left hand side of the work bench. No problems were encountered. The test was concluded successfully as indicated by the power meter showing power out on TX (see photo). 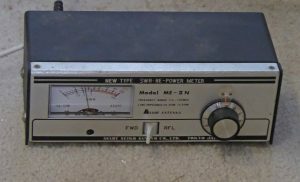 The IC7100 control head controlled the remote txcvr over the mesh in both TX and RX modes and there appeared to be no glitches with the audio feed. The test was extended to see if the control head and RemoteRig control unit would work through Bernard’s own mesh nodes. This further test was also successful. Further mesh tests will be conducted over the next week or so. More work to be done! 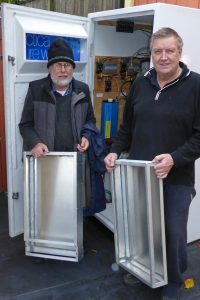 Doug ZL2AOV and Bernard ZL2BD posing in front of the Remote Station enclosure with the metalwork for the environment control mounts in hand. These will be mounted on the door. Flaps will open using servo motors for the air intake filter and outlet fans. It was a couple of days work to make these! Further work is proceeding on the thermostat control and servo system. 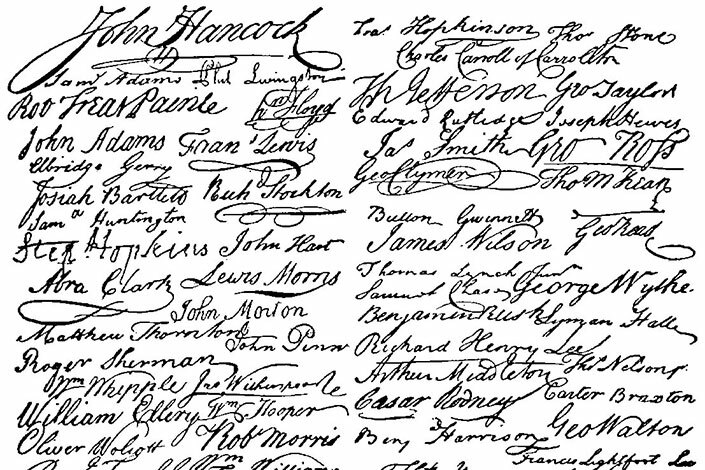 Your committee has met early in the New Year (committee meeting minutes are located elsewhere on this website). It resolved to form three working groups to progress development. Each working group has representatives from the committee, but we will adding other regular members to working groups as well. We recently held a working bee to test out the remote facilities under development. A report on this will be available shortly. The website is undergoing development and will provide access to a greater range of information on what’s going on. RemoteDX Inc is now up and running! 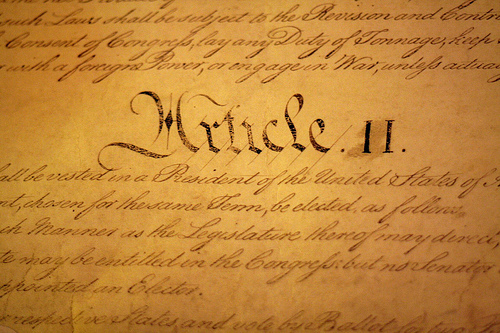 Thanks to the 19 people who turned out to agree to the formation of RemoteDX Inc.
As we approach the inaugural meeting don’t forget that you need to raise any issues with the Constitution as soon as possible with Doug McNeill.